There's nothing quite like killing the undead with your garden to bring a family closer together. It's almost impossible to have a positive conversation about casual games without someone mentioning PopCap, and rightly so. 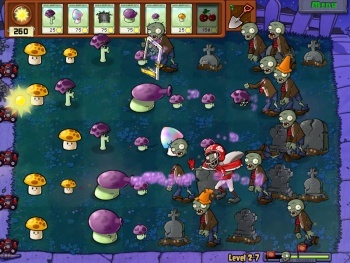 Since getting your grandmother addicted to clicking colored gems in 2000, the developer has gone on to produce some of the best casual games on the market, including 2009's mega-hit Plants Vs. Zombies. Now, PopCap has partnered with Goldsmiths University to see exactly how parents are integrating these and other games into their families. The results of their study are interesting to say the least, and a welcome counter to the anti-videogame drivel that seems to sprout up each time a news story involves minors and violence. After taking PopCap's gaming survey, a whopping 32 percent of parents claim to actively play games with their children, and 80 percent of those consider this to be "quality time." (I guess the other 20 percent must've been playing Green Lantern: Rise of the Man Hunters). One-third of moms and dads playing with progeny report stronger bonding as a result of this activity, and 20 percent of them feel like games have helped given their kids a better sense of technology. The study also went on to disprove the commonly held belief that playing videogames other than Wii Fit and Dance Central will make children fat, lazy, and unhealthy. The opinions collected show that 75 percent of parents claim their jewel-swapping, bird-slinging, fish-feeding offspring enjoy ample exercise and well-balanced diets. 30 percent have noticed improvements to concentration, and over 50 percent claim their children exhibit improved problem-solving skills (presumably other than whether to use a Wall-nut or a Tall-nut against that Buckethead zombie). "These findings are important because they highlight the social benefits of playing videogames," said Dr. Tomas "say my name three times fast" Chamorro-Premuzic, Reader in Psychology at Goldsmiths University. "Previous research has tended to look only at the individual effects of video games, but in the era of social networking, games appear to play a vital role in enhancing social relationships. The fact that both parents and grandparents are using games to connect with their children and grandchildren, and quite successfully, suggests that video games can improve social skills and make a key contribution to both effective parenting and child development." The summation of these findings is nothing but good news. Earlier this year, games were officially recognized as art , and now some legitimate statistical science is showing that families are getting closer by playing together. More-than-welcome warm and fuzzy feelings aside, you know what this really means, kids: Print out this article and use it to convince your mom to pre-order you that collector's edition of Uncharted 3 you've been begging for!